Author: Toutonghi, Pauls Set In . . . Description: The setting is Milwaukee, Wisconsin—if not America’s heart, then at least its liver—home to an array of breweries and abandoned factories and down-on-their-luck Eastern European immigrants. The year is 1989. Revolutions are sweeping through the nations of the Eastern Bloc. Communism is unraveling. And nobody feels this unraveling more piquantly than Yuri Balodis—a fifteen-year-old first-generation American living with his Latvian-immigrant parents in Milwaukee’s Third Ward. It’s a turbulent time. And when Yuri falls in love with Hannah Graham—the daring daughter of a prominent local socialist—chaos ensues. Within weeks, Yuri is ensnared by both Hannah and socialism. He joins the staff of the Socialist Worker. He starts quoting Lenin and Marx indiscriminately. His parents, of course, are horrified and deeply saddened. They try to educate him, to show him why, in their opinion, communism has ruined so many lives. But Yuri is stubborn. And his ideological betrayal will have more serious consequences than breaking his parents’ hearts. Red Weather is by turns funny and bittersweet, tinged with a rueful comic sense that will instantly remind you of the absurd complications of love. 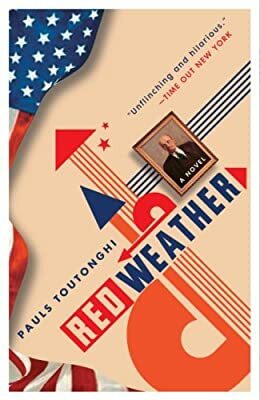 Pauls Toutonghi’s stunning debut novel is at once reminiscent of Michael Chabon’s The Mysteries of Pittsburgh and Khaled Hosseini’s The Kite Runner.